Lovers of expensive San Francisco coffee just got an early New Year's present. Philz Coffee in the Mission announced it will be raising the price of a cup of coffee by 25 cents and a pound of beans will cost an extra dollar. The coffee chain with outposts in the City and the East Bay has developed a following over the years by preparing each up of coffee differently for each person. Philz serves more than 20 blends of coffee and the baristas there are more than happy to take your coffee drinking habits and turn over a brew they recommend for you. The result is a unique taste that some love while others prefer a more consistent and traditional approach using an Espresso machine. 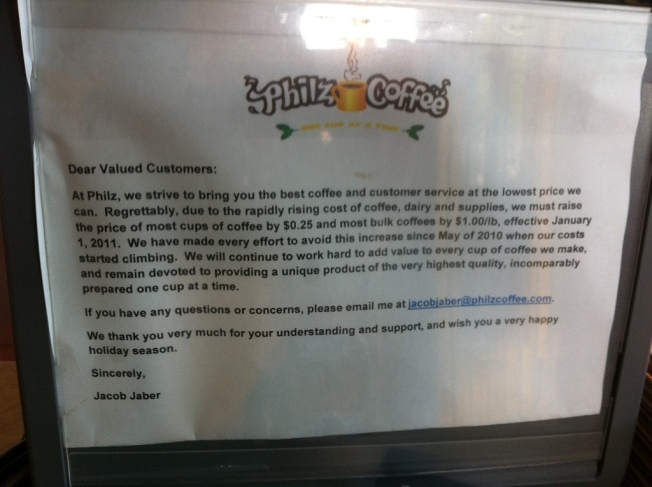 Philz currently sells a pound of coffee from anywhere from $12.95 a pound to $120 a pound.